Writing a thank-you note or email message is a lovely gesture to express your appreciation for any occasion. In the business world, a thank-you note could make the difference between getting the job, the client, or the contract, and being passed over. If you take the time to write a personal thank-you note, it will always be appreciated, regardless of the circumstances. People like to be thanked and they remember those who take the time to send a note or email. If someone has helped you at work, on a project, or with a problem, let them know you appreciate the assistance. If you are sending a job interview thank-you note, thank the interviewer for his or her consideration. If someone gave you career advice or a tip on a job opening, tell them you appreciate the guidance or the suggestion. How you end your message or note is important, too. A professional closing like “Sincerely,” “Best regards,” or “With appreciation” will add a nice finishing touch to your communication. 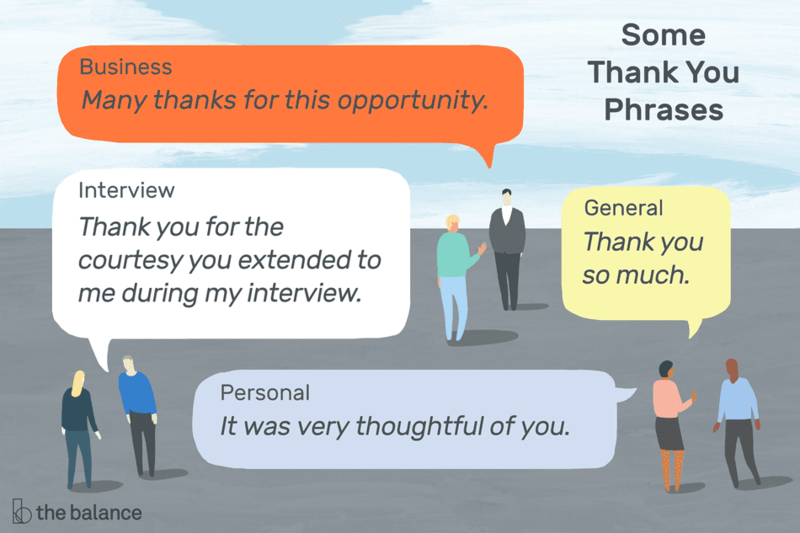 When you're job searching, you'll have many different opportunities to say thank you to those who help you, and to prospective employers. For example, when you write a thank-you note after an interview, the gesture shows appreciation for the employer’s interest, time, and attention, reiterates your enthusiasm and interest in the job opening, and reminds the employer about your qualifications and experience. Review these thank-you note samples for a variety of situations, and then choose an appropriate phrase to include in your personalized thank-you note.